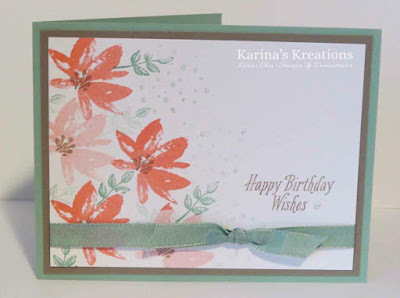 Karina's Kreations: Stampin'Up Avant Garden! I made this cute card using the Avant Garden stamp set. This stamp set is FREE with a $60.00 order. My card stock colors are Mint Macaron, Soft Suede and Whisper White. My ink colors are Mint Macaron, Flirty Flamingo and Soft Suede. I added a little Mint Macaron 3/8" Sheer Linen to the card.